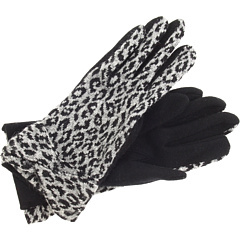 Heat up your winter wardrobe with these fierce Echo Design™ gloves. Alluring Cheetah print design in Gray, Black and Brown offer visual appeal. 60% wool, 20% angora, 20% nylon. Color. Print. Pattern. Texture. These four essential elements have been at Echo’s core since its inception as a scarf company in 1923. Today, led by the second and third generation of the company founders, Echo has grown into a global design company with a wide range of fashion accessories and home decorative products. Combining classic worldly design with a modern American sensibility, Echo creates innovative, quality products that inspire creativity, and bring a spirit of fun, beauty and warmth to discriminating consumers worldwide.